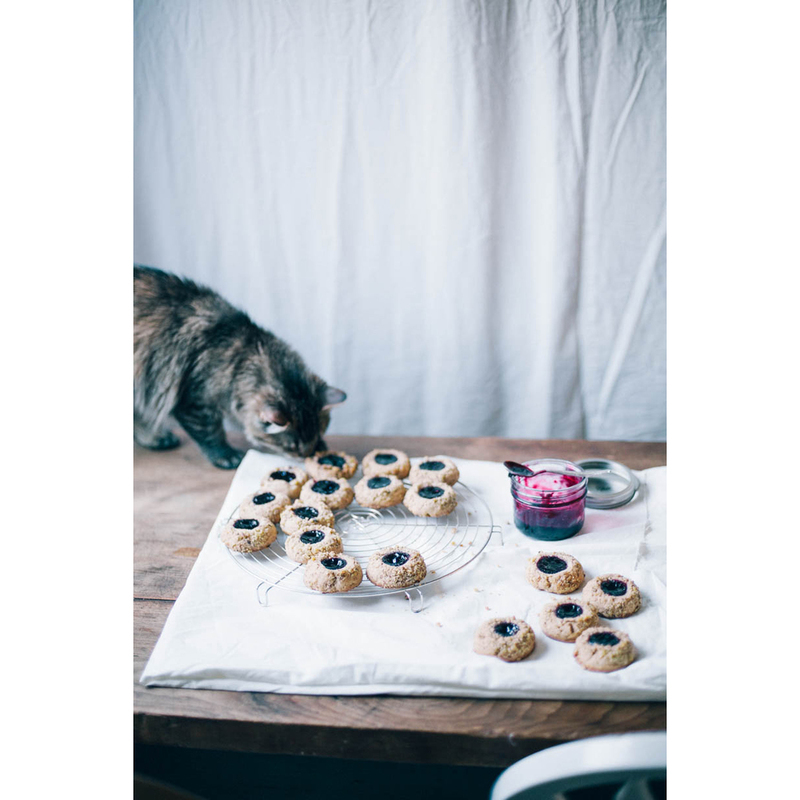 Boysenberry Jam Thumbprints — always with butter. I made some cookies. Last weekend to be honest. I found a recipe which I had all the ingredients for, or ones that were similar enough that I could substitute in what I had. They came out nice. The cookie is very buttery and crumbly, the nuts add a nice crunch and the jam bakes into a sweet sticky center. Use any type of nuts or jam combo you want. In 4 days I'll be driving down to my parents house, dropping off Christmas, then heading to the airport. I'm going to LA for a long weekend. I'm staying with a friend who I haven't seen in over a year and get to explore the city. You would think living in Northern California, I would have been to LA before. But I never have. It was always that city full of traffic and smog that we drove through to get to San Diego. I'm excited for a break from work and to see a new city. LA seems like one of those cities that you either love or hate. I don't really know what I'm going to do there. If anyone has any last minute recommendations please send them my way. I was looking up a few things online to do and I came across one really random thing that intrigued me. The museum of death. Filled with letters, artwork and photos of serial killers and such. I told my coworker about it and she looked at me like I was insane. Yes it does seem like a really weird place to go. But such a weird once in a life time crazy experience too. Mind blowing craziness. Or maybe I just have been watching too much Dexter lately. Sift flour, baking powder, cinnamon and salt into a bowl. Set aside. In a stand mixer, beat brown sugar and butter until very light and fluffy. Add in egg. Slowly add in dry mix until just combined. Using a small cookie or ice cream scoop, scoop out all dough. Roll into balls and then coat all in walnuts. Place on a lined cookie sheet and make an indentation with your thumb in the center. Fill centers with jam. Bake for 15-20 minutes until edges are just golden brown. Let cool on a rack, completely. Makes about 2 dozen depending on scoop size. adapted from a better homes recipe.